Semi Custom Reserve - Garage Doors Long Beach | G&G Garage Door Co. Creating the perfect look for your home can sometimes be a challenge. With G&G Garage Door’s line of Semi-Custom Reserve wood garage doors, it just got easier. Featuring three layer, insulated wood construction and superior hardware for safe, reliable operation. Custom and Semi-Custom, handcrafted wood garage doors feature beautiful, carriage house designs, offering old world charm with modern operation. Add curb appeal and a classic elegance to your home, contact us today for more information about this exceptional line of custom and semi-custom garage doors. Enhancing curb appeal with unique, custom garage doors, the Semi-Custom Reserve collection sets your home apart. Why would you want to put a cookie cutter garage door on your dream home? 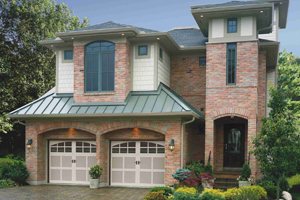 Set yourself apart from the rest of the neighborhood with G&G Garage Doors.